Carrot-cinnamon fries - paleo & vegan - NOURISH TO PERFORM. 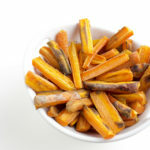 A new staple dish of mine I am enjoying a lot lately are carrot fries. I love how easy they are to make and how delicious they taste. When I tried them for the first time I just used salt, pepper and herbs. The second time I (of course) had to add chili. But in my opinion, the best way to have them is with ceylon cinnamon *. When it comes to cinnamon, you should always choose ceylon cinnamon * over regular cassia cinnamon to enjoy all the health benefits. Cassia cinnamon can when enjoyed in big quantities be harmful to your liver and cause inflammation in your body due to high levels of cumarin. There is nothing better than a bowl of carrot-cinnamon fries, a jar of my favorite almond butter * and binge watching YouTube on the weekend. For me, those fries are pure soulfood. They are also a great lower carb option to sweet potato or normal potato fries and an alternative to roasted pumpkin. The recipe also works without coconut oil * but I prefer them with coconut oil. First of all, are healthy fats necessary for our bodies and second of all coconut goes perfectly along with cinnamon and makes the fries extra crispy! 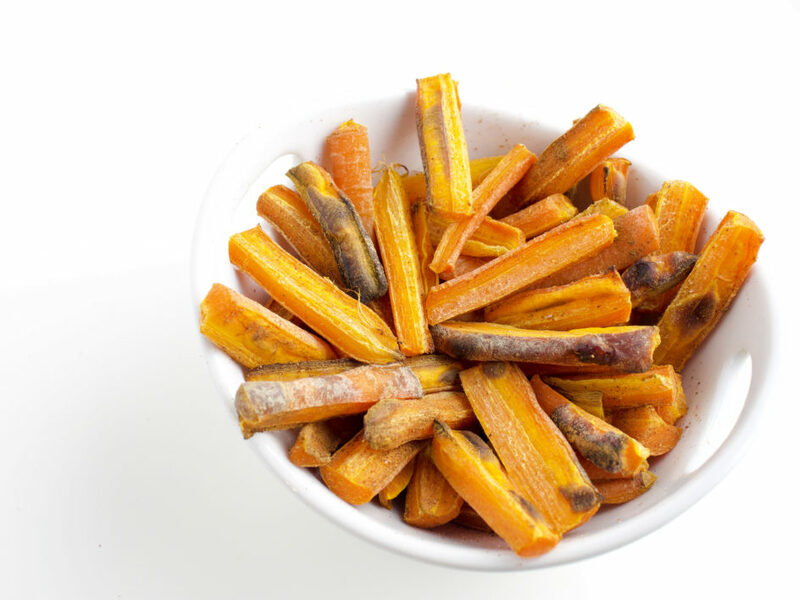 Cut the carrots into fries and drizzle them with coconut oil in a bowl. Add spices and mix it all up using your hands or a spoon./Die Karotten in Pommesform schneiden und in einer Schüssel Kokosöl und Gewürze dazugeben. Mit den Händen oder einem Löffel durchmischen. Bake for 45-50 minutes until crispy./Für etwa 45-50 Minuten backen bis sie knusprig sind. I’m a huge carrot lover and the combination of the slightly sweet taste with cinnamon is great. These fries have become a staple in my weekly meal prep.